One of my favorite spices is ancho chili powder. Anchos are nice and spicy but not hot. Perfect for good flavor but don't scare away Frankie. I use it making chilli, spicing up beans, etc. I usually buy the dried smoked chilis and cut out the white parts, remove the seeds and pulverize them in a spice blender. They keep forever. Once in a while, the particular lot I buy is still kind of moist and I'll have to dry them in the oven at about 170-deg-F for a couple hours. 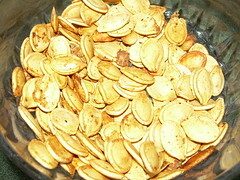 So, last night, while the wife and kid were working on the jack 'o lantern, I grabbed the seeds and went to work. Cleaned them up, sprinkled them with ancho chili powder, salt, pepper and gave 'em a quick squirt of olive oil and baked them at 250-deg-F until crisp. Yum. OoOOOoo, that reminds me! I have some red sevina dust I need to try! I don't think I'll be inflicting that on the family though.